They surround me and their ragged breath envelopes me. They scowl at me and I see they will attack me at any moment. They are three large men, all with the intent of harming me. Why am I not afraid? Well, I could say it’s because I train in Jukido Jujitsu, a powerful form of self defense. And that would be true. But I’m also in the dojo, and the people beginning to attack me are my training partners and my friends. I have to push that thought out of my mind, however. To me they are my mortal enemies. I need to use their energy against them. Because using our opponent’s energy against them, using it to our advantage, is what Jukido is all about. Sankosho, the official Kokondo guidebook, defines ki as “use of inner force.” In other words, ki is our internal energy. Ki is such an essential part of our art that it is also part of our style’s name, Jukido. Without ki, we would have no kuzushi or Jushin, major principles of Jukido Jujitsu. Jukido-ka are able to take their experiences with ki outside of the dojo, which can be called mental kuzushi. It is this same energy, in the form of motivation, that enables one to reach their shodan and beyond. Kuzushi is a major way we use ki in Jukido. Without ki, Jukido Jujitsu would be a martial art based on strength alone. By redirecting our opponent’s energy and using it against them, we use strength efficiently, instead of wasting it. We hijack their power, overextending them beyond where they want to go, and controlling their body. No matter what the attacker does, we are always one step ahead of them, manipulating their force. Using ki, we can, in a sense, predict where the attacker will go. It may seem mysterious and complex, but it is really relatively straightforward. For instance, if an attacker lunges for you, where will the attacker go next? In all probability, they will continue their attack in the same direction they began it, because energy is difficult to stop without having the knowledge of how to control it. The next thing the attacker knows, they are down on the floor or in a painful kansetsu waza—they haven’t controlled their ki properly, and they have made it simple for the experienced Jukido-ka to over-extend them and make them go where they want the attacker to go. 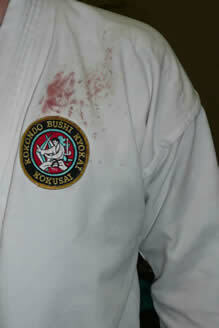 Jushin is another way we use ki in Jukido Jujitsu. It may not be as obvious as kuzushi, but it’s equally important. By putting our techniques on center line, called Jushin in Japanese, we force our attacker to resist their own body, which, in turn, uses energy. Their body folds on itself; they cannot use their energy to escape in any direction except inward—and the more they use their energy to resist, the more pain they experience. The three types of Jushin, vertical, horizontal, and triangular, all draw on this effective use of the attacker’s ki. And there is nothing the attacker can do to prevent this result, short of discontinuing their attack. Outside of the dojo, we can use someone’s mental energy and use it the same way we use kuzushi in the dojo. For example, refusing to get angry with someone when they are angry with you is an example of mental kuzushi. Instead of taking the force of their verbal blows head-on, one would stay polite and use their anger against them, or at least declining to take the bait they set for you. Instead, simply walk away and ignore them, or say something that would not anger them further. Say something that wouldn’t give them any power over you, don’t let them see that you’re angry. This is another simple way to use ki. Also, doing things when you are told is a way of using ki in the form of mental kuzushi. Instead of resisting, go with your boss’s energy. It saves a lot of energy from being wasted. You’re going to do whatever it is in the end, anyway. Why waste breath and possibly get in trouble on the way? In conclusion, you can see that the art of Jukido Jujitsu could not exist without the use of ki. It is the knowledge of ki that makes Jukido so unique, giving it an “edge” over many other martial arts. If we did not have the knowledge of how to harness and employ this life force to our advantage, our martial art would be no more than a pointless conglomeration of useless, ineffective techniques. It is ki that makes Jukido so powerful. The ability to understand it, to control it, is what makes Jukido such a formidable and effective martial art. It is, in turn, the same ability to utilize both our ki and that of our attackers, that make a martial artist great.